. : Optics & Photonics Focus :: LEGO-Optics :. Some scientific discoveries completely change how we look at things: new experiments show that laser theory should be extended to include dark pulse emission. Optical solitons can propagate undistorted over indefinitely long distances. Solitons may interact with each other. Here we review some possibilities for soliton control. A LEGO optical setup. Beam-expander system — He-Ne laser, beam stopper, polarizer, 2 mirrors, concave lens, convex lens, screen — built using standard LEGO components. The mount system is more compact than older ones and all optical parts are on rotating stages in order to make the adjustment of the optical axis easier. This is a well-known Galileo type beam expander (4X magnification). Inset: path of the beam. When I was a child, I loved LEGO. All those colorful little bricks that morphed into beautiful toys, simply by following the instructions that came with them. However, this is not why I loved them. I loved them because I could avoid following the instructions and use my imagination to create anything from a spaceship to Uncle Scrooge’s Money Bin. 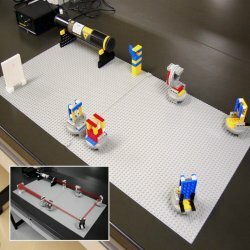 I am not alone in this; Junichi Takahara from the Engineering School at Osaka University (Japan) also loves to not follow LEGO instructions, and he has built entire optical setups out of LEGO bricks in order to teach optics to students. Junichi Takahara is actually a scientist mainly doing research on plasmonics, and in his own words "LEGO optical mounts are my sub-theme." He originally got the idea for using LEGO bricks for the construction of optical setups a summer about ten years ago when he was organizing a workshop for highschool students. "I had to carry heavy metallic optical mount systems from our lab to another building in our university. We carried them by hand with my students." How much easier it would have been if the mounts had been made out of plastic! Out of plastic? 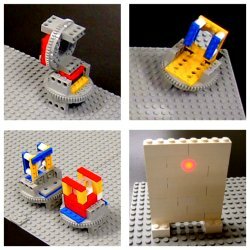 "At that time, incidentally I was instructing a robot programming class for undergraduate students using LEGO Mindstorm. So, I had the idea." Actually, LEGO brick optical systems had already been proposed in 1997 [1,2]. However, the LEGO bricks had been adapted to the special needs of an optical setup. They had been cut, drilled or bonded together. And when this was not enough, some special homemade parts were used — some plastic screws. The challenge for Junichi Takahara was set: to build his optical mounts using only original LEGO parts without altering them. LEGO optical elements. Clockwise: a polarizer; a mirror; a telescope; and a screen. All parts are built using standard LEGO components. Before long Junichi Takahara succeeded in mounting 1-inch lenses or mirrors by using only LEGO bricks. It soon became evident that to mount a light source as well would not have been a major impediment: a rod shaped laser, such as a compact He-Ne laser or a Laser Diode, can easily be held by two edges of LEGO parts. The very first mounts, however, were quite bulky and did not allow one to tilt and rotate them — which, as every experimenter knows, are two of the most fundamental activities in an optical lab. Such mounts have recently been improved by reducing the number of bricks needed; it might seem like a minor improvement, but, by reducing the mount volume, it is finally possible to tilt and rotate 1-inch optical parts. With time and experience more complex setups came about. From two-lens systems, such as a beam expander or a telescope, to a simple spectrometer based on a diffraction grating, and also a setup for optical filtering in the Fourier domain. The next step will be to build a LEGO-interferometer. Audaciously, Junichi Takahara does not even exclude trying to build a simple LEGO-microscope in the future. "As for the microscope, I am interested in it. It's a good idea for demonstration. I will try it." From the engineering point of view, the main advantage of LEGO optical mount systems is that they are light weight and low cost, when compared to conventional heavy metallic ones. "We can easily carry them anywhere," explains Junichi Takahara. But, this is only one aspect, only the technological aspect; the main motivation for using LEGO optical setups is educational. "Actually, a hands-on approach is always more direct in order to have the students learning the basic concepts of optics. I really cannot overstate the importance of a hands-on experience in science!" says Junichi Takahara, "LEGO bricks are the ideal toys for a hands-on experience. I think LEGO brick systems are different from conventional educational toolkits for science. Usually, educational toolkits are designed for specific experiments, and they come with manuals for the students to follow. So there is little freedom. I think LEGO brick systems allow for a higher degree of freedom. Students can work out for themselves how to mount the optical parts. We tried to use LEGO bricks in optical experiments for undergraduate students in Osaka University some years ago. They enjoyed decorating the optical mounts. Sometimes LEGO-setups were even too decorative to perform the laser experiments. I could see they enjoyed it." "Takahara's approach is brilliantly simple," comments KiKi L’Italien from the OSA (Optical Society of America, Washington, DC, USA). "To take something that is recognizable by most students and to use it as a teaching tool is profound and at the same time quite efficient. Takahara's method makes learning obtainable for everyone — and the materials may be used again and again." As you can see, a combination of a seemingly simple children’s toy, imagination, and science can make optics accessible for everyone. J. Bell, Opt. Laser Eur. 32–34 (October 1997). F. Quercioli, B. Tiribilli, A. Mannoni, and & S. Acciai, Optomechanics with LEGO, Appl. Opt. 37, 3408–3416 (1998). Junichi Takahara, Kazuhiro Manseki, and Tsuyoshi Konishi, Photon block project (in Japanese), Oyo Buturi (2007) 76, 34-38 (link).